We’re always providing reasons to stay out late with landscape lighting, so why not offer another way to enjoy your outdoor experience? Outdoor speaker systems have become a popular addition to any backyard staycation, not to mention a natural extension of our offerings. The latest in this line of technology is not a pair of wall-mounted loud speakers or speakers smartly designed likes rock, but instead a set of sleek speakers placed strategically within your landscape. Commonly finished in an earthtone shade, these small speakers bear a close resemblance to up-light fixtures and blend perfectly into the environment. Neighbour friendly, sound only projects in the pointed direction. Sub-woofers can be buried in the garden in most cases, but are also available as stylish designs like patio tables and planter-pots. These wired systems produce fantastic sound and atmosphere. This system can easily be incorporated into your existing system or set up with new hardware. Pool and patio season just got better! Want to have your backyard rocking this year? Give Moon Glow a call today. Replace your outdoor light bulbs and begin saving with LED! Moon Glow can take away the risk associated with climbing a ladder. 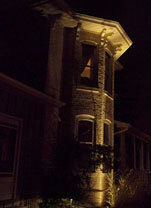 Regular and Edison-style options are available to replace a variety of outdoor bulbs including soffit and chandelier. Not only will making the change give you a quick return on investment, but also provide matching colour tones to seamlessly match with your landscape lights. Contact us today to make the switch. This entry was posted in Landscaping, Lighting Trends and tagged landscaping trends, outdoor soeakers on August 20, 2018 by moonglow. The dilemma with trends is that they come to pass. It is important to us at Moon Glow that we get behind a trend that will stand out and last beyond being a fad. Not to mention selecting based on quality. A few recent trends have lent nicely to the outdoor living movement, long term. Also referred to as patio string lights, this style of lighting has seen a major upswing of usage. Complimented by LED filament lamps to give a classic feel, these stringers can accentuate any patio. A warm, welcome glow from overhead is inviting, not to mention its amazing appearance. The key elements for us is that they are properly installed, durable and have a consistent colour output. Lots of retailers offer this type of product, but we have discovered a few low-voltage options that will tie in nicely to your current system. A simple switch can be added to provide separate control. Another hot item that has staying power, but no, we are not referring to the crystal chandelier. Three and five bulb fixtures are the most common choice with several tasteful and timeless styles existing. Now with LED bulbs that make the simple conversion from line voltage to low voltage, we have a large selection. A well-placed outdoor chandelier can set the mood just right or get everyone to the dinner table. A dimmer switch is the perfect complement for control. Not the first time we have brought this option up, but a definite patio essential! Mounting a switch controlled down-light to a structure and directing at the cooking area is one way to achieve functional BBQ light; another alternative and personal favourite is a table-mounted gooseneck design. This fixture includes a convenient switch at its base, and an adequate amount of light to get the steaks cooked to perfection. If you are inspired by these trends, give Moon Glow a call today. This entry was posted in Landscape Lighting, LED, Lighting Trends, Outdoor Lighting Ideas, Planning Landscape Lighting on June 20, 2018 by moonglow. As mentioned in an earlier blog here, home owners are investing in their properties to create a beautiful space for a ‘Stay-cation.” Within these backyard resorts, most likely there are two main focal points, decks and patios. Lighting is a key component to creating an inviting space into the evenings and four months a year. A deck is a great space to create a dining area or outdoor kitchen to enjoy a glass of wine and have dinner with friends. In these areas, landscape lighting not only provides functional lighting for food preparation but also creates a relaxing mood and atmosphere all in a subtle manner. Soft down lights highlighting the dinner table, soft lighting for safety under railings and steps, and a light on a separate switch on the BBQ to help ensure you get steak grilled perfectly; the possibilities are endless. 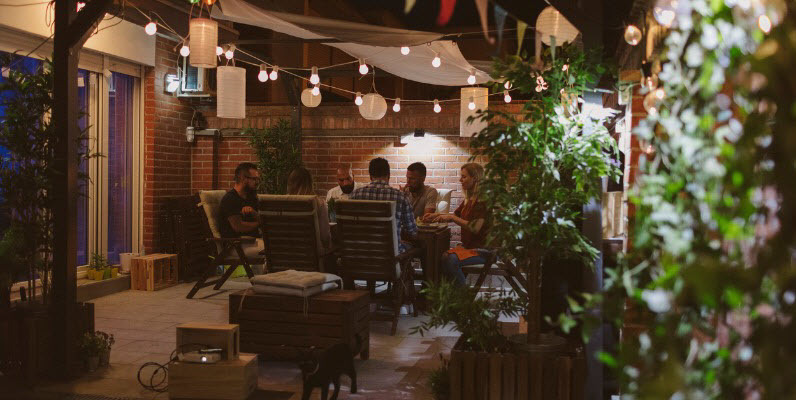 No exception to the possibilities with lighting patios and lighting go hand in hand. A light below the pillar cap will not only accent the texture of the wall but will highlight the walkway. Linear lights on steps, sidewalls, or a seating wall provide a warm glow to your backyard resort. If your backyard resort could use a nice warm glow, please contact us today! This entry was posted in Lighting Trends and tagged deck lighting, lighting trends, outdoor lighting, patio lighting on July 15, 2017 by moonglow. Sustainable design is on everyone’s mind these days. For both interior designers and landscape designers, there is an increasing emphasis on making ecologically responsible design decisions. Materials are chosen not only for their appearance, but for their carbon footprint; how much energy they use over the course of their lifespan. This sometimes translates into interesting and unexpected design ideas, both in the home and in the yard. 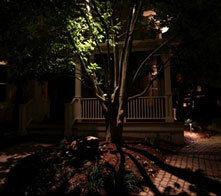 This focus on sustainable, or green, design has also impacted the landscape lighting industry. In particular, recent trends include significant use of LED lights and solar powered lighting. Homeowners will find this has resulted in new and exciting ideas and products for the home landscape. Light-emitting diode, or LED, light bulbs are much smaller and brighter than traditional light bulbs, while using much less energy. Just a few watts of power can light up a long string of bulbs. Rope lights, clear plastic tubing with a series of lights inside, are a fun use of LED technology. 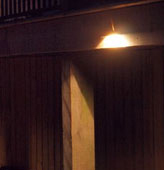 Tucked under the edge of a deck, handrail or step, these subtle lights can be both unobtrusive and dramatic. Walkways and paths can be lit much more efficiently and safely with LED lights. A larger number of low level lights creates more even lighting than a smaller number of high wattage, bright lights. With the extent of outdoor roadway, street and building lights present today, in many places, it can be difficult to truly see the stars in the nighttime sky. This is why we opt for subtle lights that diffuse long before they disrupt a black night sky. Pathway and walk lights will typically have caps or hats directing light toward your feet, not your face. Softer light is often the most effective approach for the landscape. Harsh, bright lights create a lot of contrast, making it difficult to see beyond the immediate circle of light. A softly lit patio or garden gazebo is a more pleasant place to be on a summer evening. Consult with a professional lighting designer to figure out the best light levels and effects for your landscape. Gone are the days of bright overhead lights above your entry door, letting the interest of your architecture get completely lost in the darkness. Subtle lighting from lower points on the home can give enough light to guide you in and out safely, while bringing texture to your home (rather than the flattening effect of strong exterior lights). A hidden benefit of this kind of gentle home spotlighting is that it creates fewer dark shadows around a home where trespassers could be easily concealed. That tree in your backyard that nobody pays much attention to? The one that seems boring during the daylight while it’s surrounded by colourful flowers and vibrant shrubs? It’s unique geometry makes it a striking focal point for the evening. When illuminated, the shadows that are created can be quite dramatic, bringing forth a feature that might otherwise me overlooked. The presence of this new technology means you can creatively light much of your landscape with very little impact on your electric bill. Underwater lights for fountains or pools and lights for decks, patios, paths and individual trees are only a few of the possibilities. 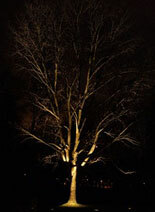 Landscape lights will make your backyard an enjoyable place to be at night. Contact us if you’d like to start getting more out of your property. Let us brighten your landscape! Yes, send me free tips on making my lighting fantastic! Call us today, or fill in the form to discuss your personal moonlight. Sitemap • Privacy • © Moon Glow Lightscapes. Designed by WEB ROI powered by WSI Milton.